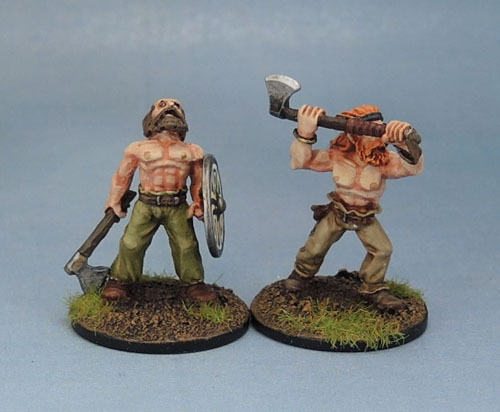 Eureka Miniatures | Azazel's Bitz Box. This is the final post of my first “book” of Vikings – those given to me in bare-lead form by Mr. Cannon from work, who has just taken on another job and somehow managed to duck both a planned painting day and a series of SAGA (and possibly Frostgrave) encounters (admittedly, due to some family health issues on my end). I’ll catch up with him again, but it might not be until September. Anyway, I thought a group shot was apt to cap off the collection that he generously gave to me (forced me to take them, actually!) I’m thankful though, as I’ve enjoyed painting them and have now gotten into my own collection of metal Vikings that may have otherwise just sat around forever in the leadpile. I say may. Let’s be real. They would have. The next Vikings to be shown will be “my” Vikings, as I wanted to completely finish all of the ones given to me first, out of respect for the gesture. 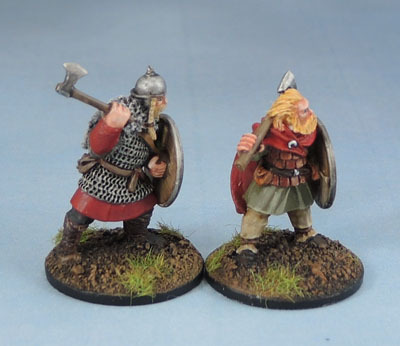 Today we have the next couple of figures from my Viking project. I’m not sure of the origin of t̶h̶r̶e̶e̶ two of these models, as once again I got them from Cannon at work. They’re smaller than the Foundry models, so I know that much. As per usual, painting the shields was one of the more enjoyable parts of these models, despite being a slow process of researching appropriate designs that look good and are achievable. The guy on the left is my first attempt at painting knotwork at this scale, within the arms of the cross. I also figured I probably needed at least one more Raven shield in the mix, so there’s that as well. The figure with the knotted cross on his shield is actually a conversion. Cannon had replaced the original head with the one with braids and domed helm, and also sculpted the fur cloak over his shoulders. He’d also changed the weapon to the (plastic) axe. If you can’t tell it’s a conversion, it speaks to what a good job he did with it. It looks pretty seamless to me! 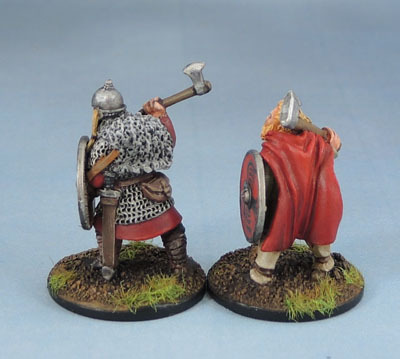 Clothing colours are always hard for me with these Viking figures. Wanting to strike a balance between clean, colourful clothes (as we believe they favoured) with not getting too bright and “90’s Games Workshop” and being aware of the limitations of the natural dyes of the day, and the fact that they (naturally) faded over time, while wanting to retain some earthy tones in there, which would have presumably been the colours of majority of the easily-produced cloth… We know that for much of history, reds and purples were signs of wealth – especially strong tones. Blondie here obviously spent most of his money on his luxurious crimson cloak! 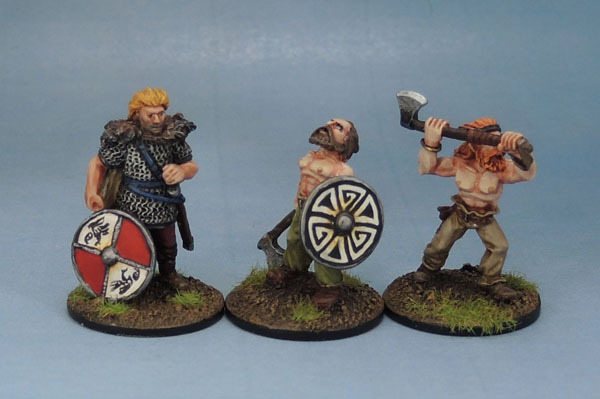 The lad looking a little mode berserker-ish here than the others, with the honking great axe is from Eureka Miniatures’ Beowulf line. I mentioned the fur that was sculpted on the guy with the knotwork shield above; I think he’d also sculpted the fur on baldy here as well. I honestly can’t remember since he’s been undercoated and WIP for so long now, but I remember a couple of them had sculpted fur on them, and without knowing their origin to look them up to check, I really cannot tell. Update! 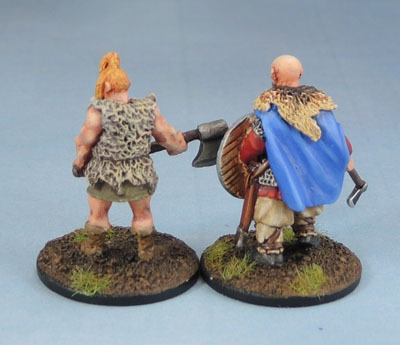 – It turns out not, as “baldy” is actually Gripping Beast’s own Jarl Sigvaldi, Jomsviking Hero. Are any of the other models I have here amongst the three hearthguard that he comes with? I have no way of knowing since, uselessly, Gripping Beast’s website doesn’t show them at all. 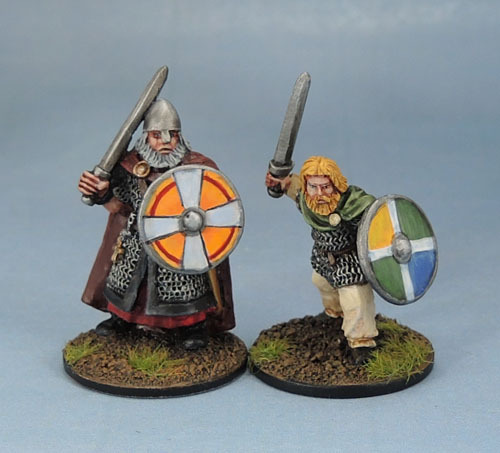 Obviously one of these guys is well suited to the Berserker role, while the Jarl Sigvaldi is set up more nicely to be a Hearthguard (which works well, since that’s what he’s supposed to be!) I was in two minds on going so bright with the blue cloak, but decided that he looked like a veteran of many battles who would in turn have earned enough wealth for a nice looking cloak. Finally, the group shot of this small cohort of axemen. More vikings to come, soon! 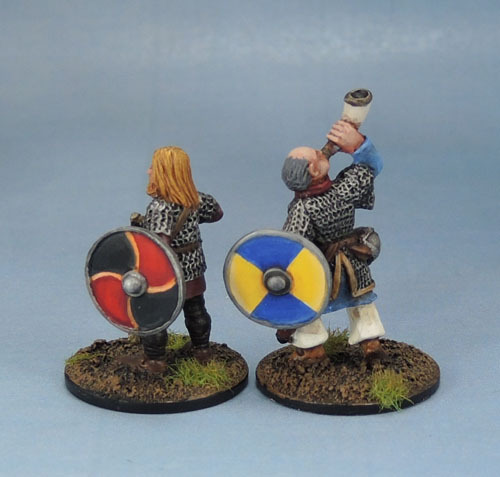 The next post of my small Viking project. 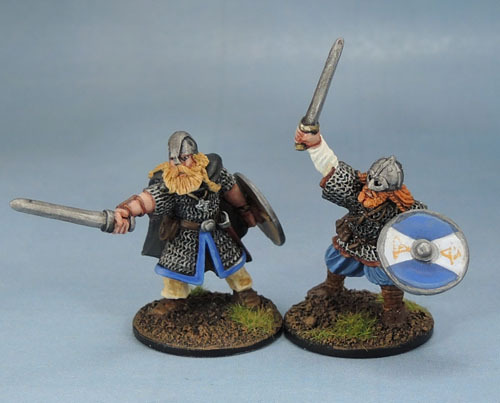 A couple of weeks ago, when I got up on the morning of Christmas Eve 2016, I decided to paint up some Vikings, and see if I could get them done by Boxing Day. I very deliberately selected four figures. Two of them were the berserker pair that, while now part of the Foundry catalogue are ex-Citadel models from the truly Oldhammer days. Before everything was All-Warhammer, All The Time, Citadel has small ranges of Normans, Vikings and Feudals under the Fighters/F4 category. 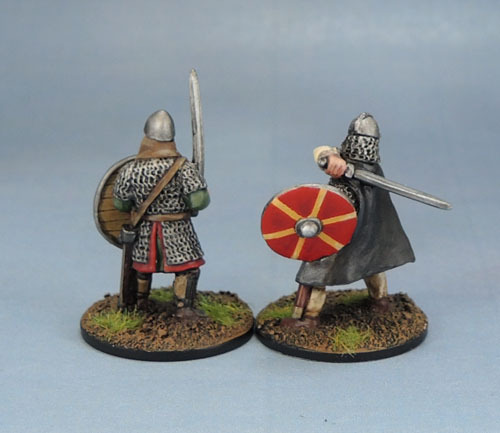 When Bryan Ansell resurrected Wargames Foundry as a Historicals company while purging the historical ranges from Citadel, he moved a large number of moulds across that he deemed appropriate. 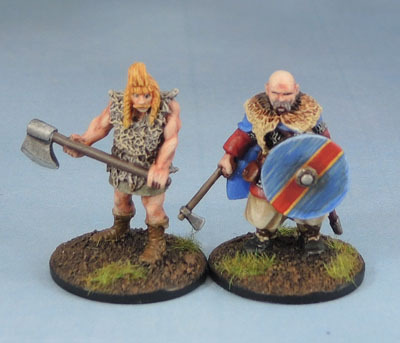 The two berserkers here were amongst the models who made the trip, and as such, are still available today. 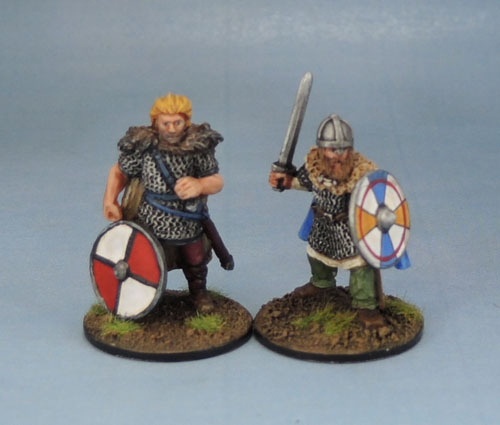 Erik and Thorir the Ex-Citadel Foundry Vikings. I actually owned both models back in the day. 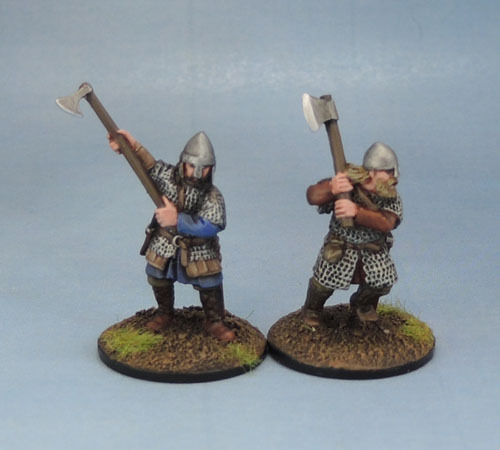 Erik, the model with the 2-handed daneaxe was broken at some stage, losing the axe and chunks of both arms – while Thorir, gazing at the sky, was simply lost to time. I notice that there are a couple of other old models that I always liked still available in the Foundry ex- range, so I’ll have to do another Foundry order before too long to pick them up. I should point out though that all of these models, like my other painted vikings in the above-linked posts came courtesy of the Cannon man from work. These two were painted very quickly, and done on time. While painting them, I noticed the shield boss on Thorir’s shield. 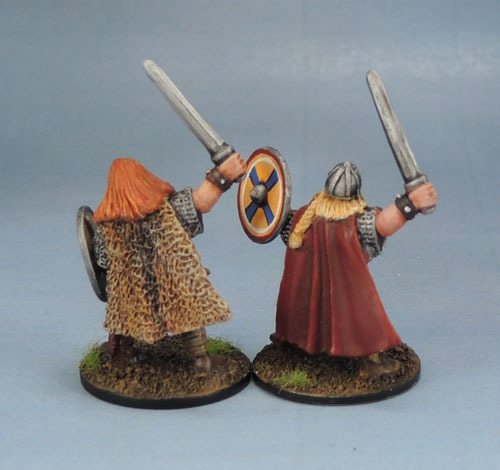 This was unfortunate, as I’d selected all four figures based on getting them done quickly, so the two old-school models that were mostly flesh and pants, and the other two that had a good amount of armour and chain on them – and no shields amongst them! So…. erm. The next pair of Vikings are essentially “just some guys”. I’m not sure of their manufacturers, though I think it’s pretty safe that they’re from different ranges given the difference in sculpt style. If/when I find out where they’re from, I’ll update. In the meantime I have nothing particularly interesting to write about them. I used a little more in the way of the colour palette on these guys, but still kept them quite muted. 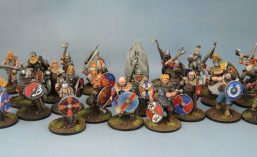 Finally, a group shot of all my completed Vikings to date. There are quite a few more where they came from! Part Two then, of my Vikings. These figures were mostly completed in 2016. On the 14th of November if my record-keeping is accurate. Of course, I then realised that the horn-blower who wasn’t yet finished should really have a shield as well, and so completing the sextet went into painting limbo, since the horn-blower isn’t exactly my favourite model from the bunch. Since I had to paint a Viking shield for another model a few days ago, I did this one as well. His mate in the picture above is one of the smaller figures amongst my metal Vikings, but he’s got a bearing to him, both in the pose and especially in the facial sculpt. Like he’s the sort of bloke you wouldn’t want to mess with. The horn-blower on the other hand looks like he has a big plum for a head, but the ruddy cheeks work for his pose. Of course, now that I’ve finished it, I’m happy enough with the horn-blower’s shield. Simple, but neat and effective. I went with more muted yellows than I usually do, from almost white into an ochre, rather than orange. 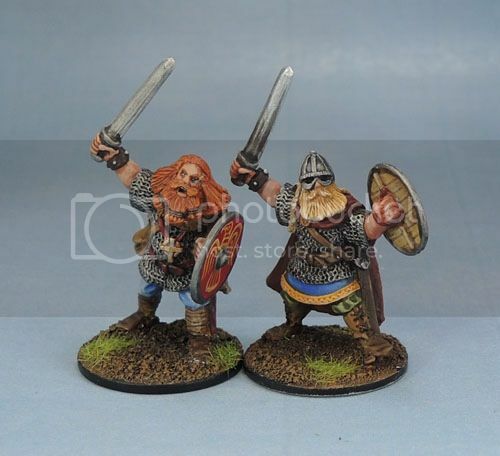 I believe that the larger of these two is a Viking Hearthguard model, and he’s a big chunk of metal. Since he’s chunky and quite well-geared, I gave him a deep red cloak to suggest wealth, and grey hair and a marked face to suggest that he’s both a veteran of many battles as well as (probably) some lucrative international bodyguarding duties. His friend here is painted in simpler, more muted and earthy tones. I tried to “streak” the paint in his shield to suggest a less wealthy origin. Damn, at this scale, the blown-up photographs really emphasise every flaw in the freehand shield painting. They look much neater and straighter at their actual size of 10mm or so. 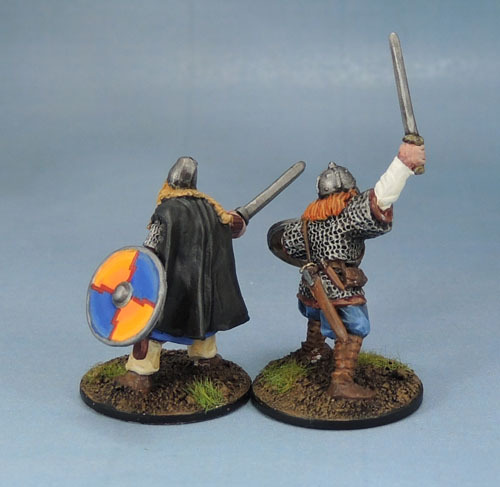 The final pair are amongst my very favourites of all my Viking models. I think these two are both by Foundry again – Edit – Turns out that Mr Gingerbeard here is actually a Gripping Beast figure, “Viking Warlord“. I’d had him pegged as a Foundry figure as his sword is very much the same as the Foundry models, and often the style of weapons on historicals can be a good clue as to which figures are from the same range, along with size and pose style, both of which fit in well again with the Foundry. Ahem. Anyway, it’s the dynamic posing that really works on these for me. Not a lot more to say about these two. I like the models and I like the way they turned out with paint and their shields added. These models, like the first half-dozen will be used for SAGA amongst other things. 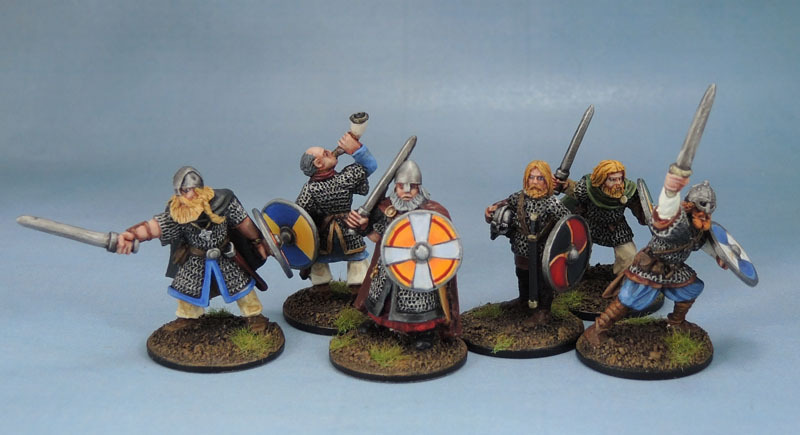 I’ve got a nice selection for my Hearthguard, and the others will make up a unit of Viking Warriors for the time being. I’m still short a model for a final warrior or my Warlord, so I’ll have to get some more done soon. I’ve just finished a few more Vikings, so once they’re dry and flocked I’ll have them up here as well. I can see a lot of the metals here being spread out amongst the plastics eventually to use as unit leaders. 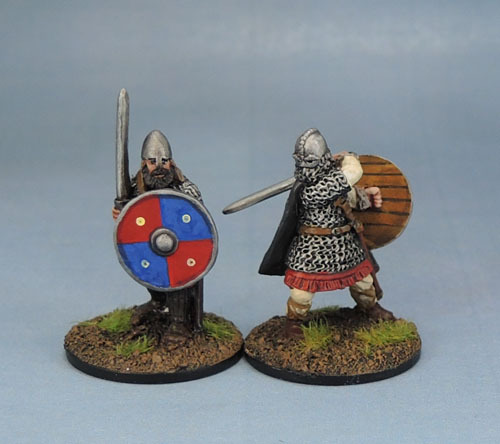 When I got to the second half-dozen of my Vikings, I’d decided much more consciously to paint the shields with a palette that complimented their bearers’ clothing and overall colour scheme. I’d been doing this to an extent with the first set, but I’ve been much more aware of it since then. A flaw in the way I used to paint years ago was trying to get too many colours onto my models, when a smaller palette with more variation of those colours works better for the models far more often. Something a little different to the norm. 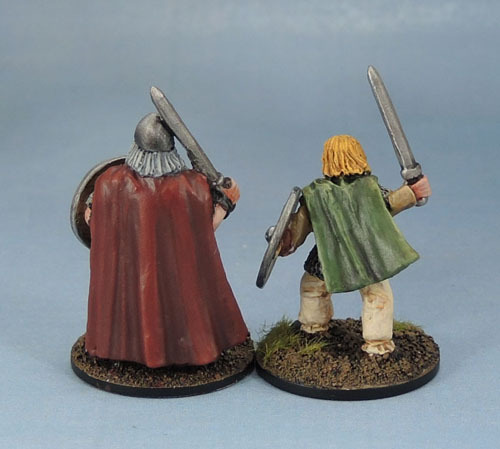 A bloke at work, who I’ll call “Cannon” and I accidently found out that we both collect and paint toy soldiers last year, when I happened to be carrying a few LotR models past him at work and he was “hey, what are those?” and then to my shock recognised them as LotR models. 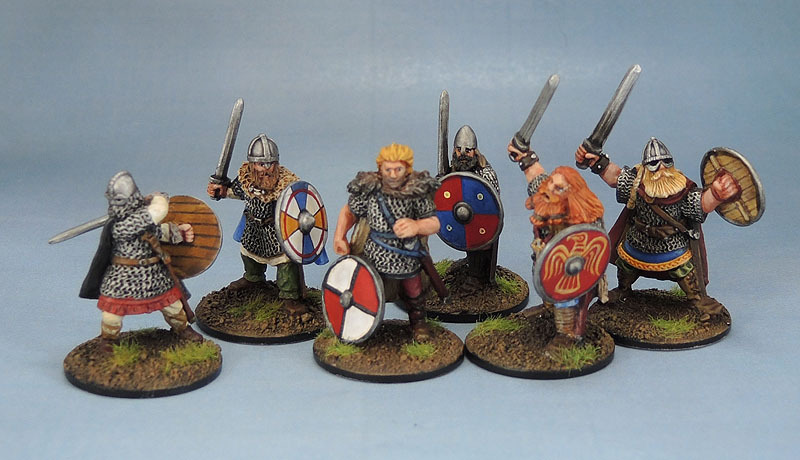 Sometime earlier this year, he gave me a pile of spare Vikings, in what I think was at least partly an attempt to get me to paint something non-fantasy. There were some nice figures in there, and they’re a mixture of Eureka, Foundry, Crusader, Gripping Beast and possibly others. I’m really not sure of all of their origins, so I’ll have to ask him to let me know which are which so I can properly tag them. A lot of the more subtle highlighting on these guys just hasn’t come out in the photographs, particularly on the shields here. 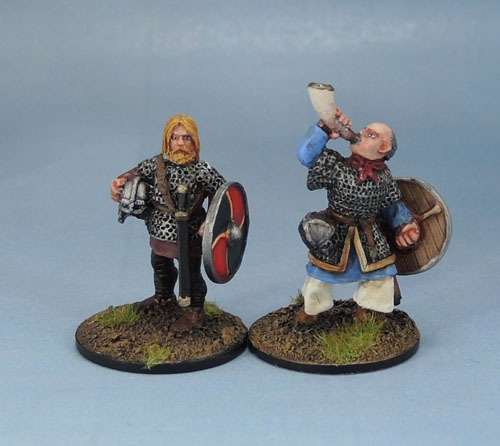 The guy on our left is a Eureka Miniatures model, but I’m not sure about his blurry-faced friendo. I believe that he is a Wargames Foundry model. 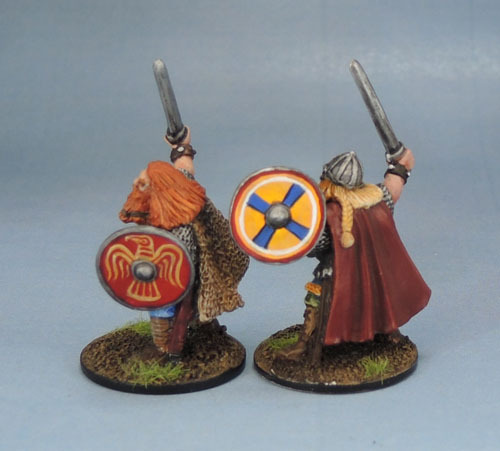 Shields are both freehand, and in retrospect I probably should have done something fancier on the red-and-white since he’s got a real leader feel to him, but he was the figure I painted first, so I wasn’t yet confident in freehanding Viking shield designs. Update Edit: He now has some freehand happening on that shield. While there’s plenty out there regarding Viking shield designs, you’d think that figuring out realistic Viking clothing colours would be a reasonably easy task, but it was much, much harder than I expected. 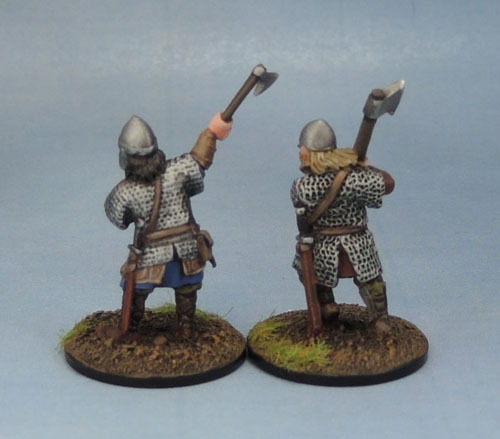 I noticed initially that Foundry et al have their models painted in much the same way as their Celts – all stripey trousers and colourful patterns. I wasn’t so sure, so in doing some research online, I found quite a bit of contradictory stuff. The TV show “Vikings” had at least one full-time researcher, but then, it’s a TV show. Of course, some random guy on the internet decided to “big man” himself when I dared in a forum to suggest the show as one potential source of painting inspiration and bothered to lecture me on how everything in it was wrong. I guess he must have been there in the 10th century. In the end, I decided to avoid the whole “stripey trousers” look entirely. I’ve got Celts to paint down the line and so they can have the plaid and stripes. I’ve kept the Vikings to solid colour for the most part, with a mixture of bright colours (especially on shields) and more muted, earthy tones. I’ve got a pile of plastics to paint later, so I’ve decided to go richer overall in tone with the metal models. 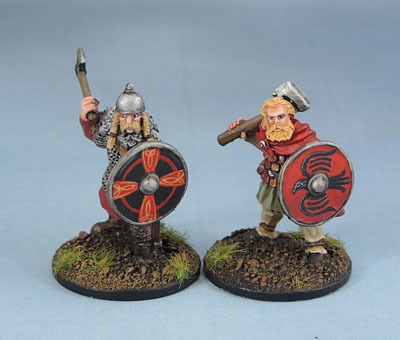 These models are where I’ll draw my Warlords, heartguard and other elites from, and so these guys are much more the professional Viking “soldier” and more likely to have visited Albion on “shopping sprees” as well as travelled the Mediterranean or even served as Varangian Guard. Based on these loose ideas, the metal models are much more likely to be wealthy and so afford more colourful clothing, as well as richer shades of colour. The two blokes below really fit that ethos to a tee. The Foundry models are in the typical chunky style, but have a lot of character to them. 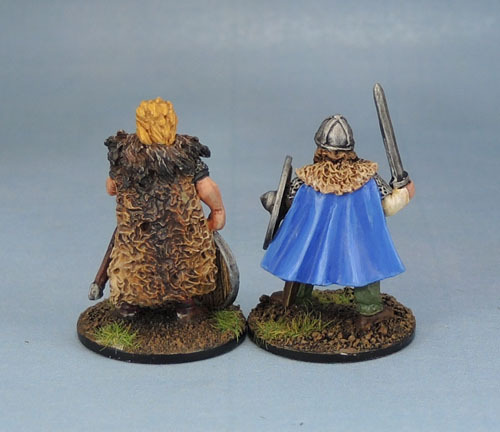 There’s a bit of Brian Blessed (in a ginger wig) to the right guy, and they’re both the sort of figures that Space Wolves seem to want to channel. I’ve got a couple of half-painted Wolves squads I should finish one day as well… and some more actual Wolves half-assembled. I enjoyed the freehand designs on these guys. I’m especially proud of the raven. The cross designs look a little wonky, but the photos are of course blown up to quite a few times their actual size, so look much straighter in person. I decided that I might well use transfers on a lot of the Viking models, but all of the metal models would get freehand shields. Even when doing “red” cloaks, I’m trying to avoid the bright reds of my fantasy models in favour of darker, slightly earthier reds – while maintaining the richness of colour. The group shot. These guys could comprise of half a KoW regiment, but more importantly, Warlord, hearthguard and a spare model) in SAGA. These initial six were finished back in October. I’ve got another batch of five just waiting on their last man before I show them, and a few more now on the paint desk. 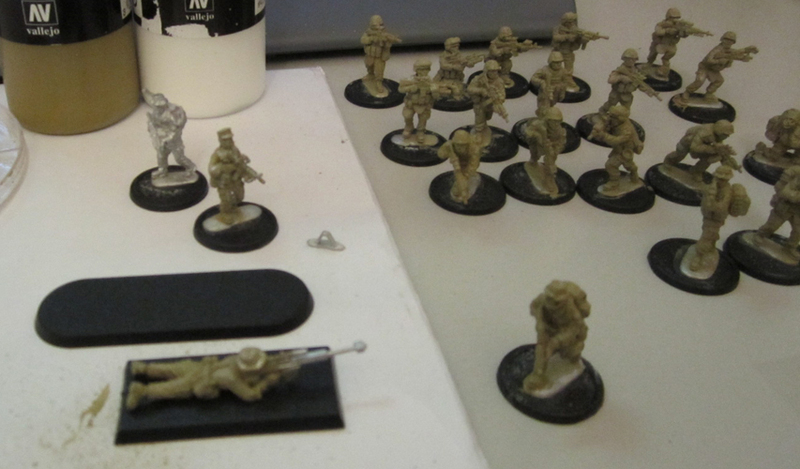 Since I’m quite excited about these new Modern USMC figures from Eureka, I’ve decided to start painting them already – typically figures sit in my “to do” pile for anywhere between months and forever (don’t ask me how many unpainted Space Marines from the 1990’s I still have). Moderns though – I’ve always wanted to get hold of moderns, but until very recently they have always been in 20mm, or quite frankly – not good enough models for me to be willing to spend money on. I guess I’m a bit of a snob in that sense, but I grew up with Games Workshop sculpts by Jes Goodwin, the Perry Twins, Kev Adams, Mark Copplestone et al, and later on, figures by the Rackham crew, so seeing figures that looked mostly-smushed or not much better than what I could sculpt myself never did it for me. As well as a follow-up order with Eureka, I’m also planning to pick up pretty much the entire Modern (Western) range from Empress Miniatures very soon – US Forces and Brits. Again, they look very nice, and should add some additional variety to my modern forces. 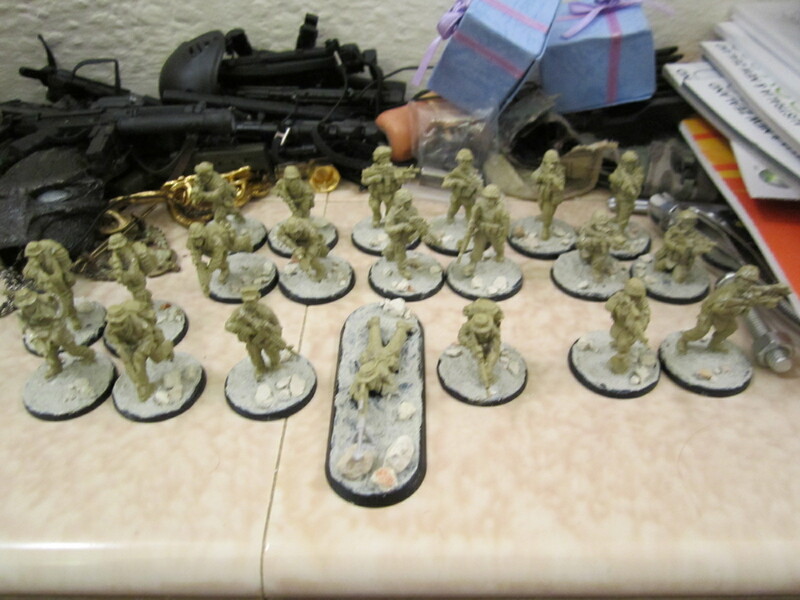 I started by basing them on 25mm rounds from Proxie Models. A couple of months ago I ordered a ton of bases ($70 worth) from Ken after some recommendations on Dakka, and they are both dirt cheap and excellent quality. I’m tempted to order more just to have a healthy stockpile for the future. One of the new things I’ve decided to try with these was the coloured primers I picked up a couple of months ago from Vallejo. These are the new Acrylic-Polyurethane primers. I picked up the full range of 10 colours in the 200ml bottles, in the hope that I’ll never need to buy the stuff again. I’ve heard people talk about how they’re wonderful for plastics but not so great for metals. Well, they applied very nicely and smoothly to my Marines using a 3/16 flat brush, and once dry, the paint has indeed “shrunk” into the detail, leaving them unobscured. 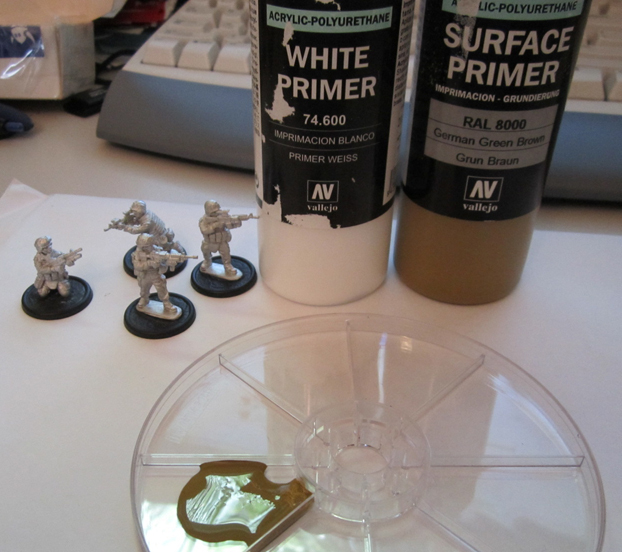 I have to say, using coloured primer has been a little hard to get my head around – after more than a decade of using a spray can, using a brush to apply coloured paint just seemed wrong in some way – like I’ve started basecoating without undercoating. The Vallejo primer was very smooth in it’s application, and feels quite nice on the models. I used a 2:1 mixture of RAL8000 German Green Brown with White, as I figured if I’m going to use coloured primer I may as well lighten it to be a bit closer to what will be my main base colour. In all, it turned out well. After drying I’ve spotted a few places on a number of the figures that I’ll need to touch up. After that, basecoats! 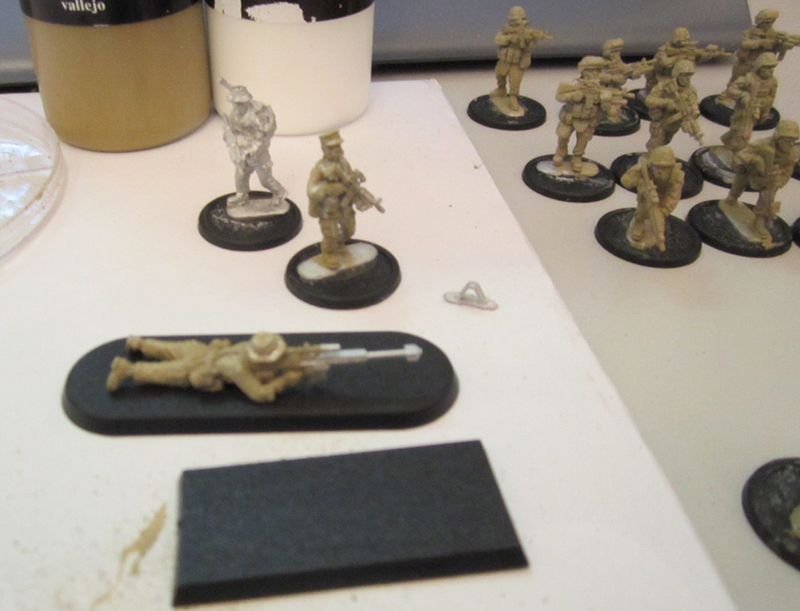 The one thing I’m not sure about is the basing of the sniper. He’s too big for a 40mm round, which leaves me with a choice of the two 40k cavalry bases. The WFB square one leaves his rifle overhanging, which means I could more easily position him as shooting out of a window etc, but the round one will better protect the rifle from damage in storage, transport and play. I can also do a little more on the base by adding some rocks and such, though not to the extent of making a mini-diorama, as I feel they detract from models when used as gaming pieces. I also prefer round(ed) bases. A 60mm round would be overkill, I feel. I’m using another figure as a spotter, but I prefer to have 2-man teams based separately as it offers more flexibility on the tabletop and in storage. In the end, I went for the rounded base for the extra protection. 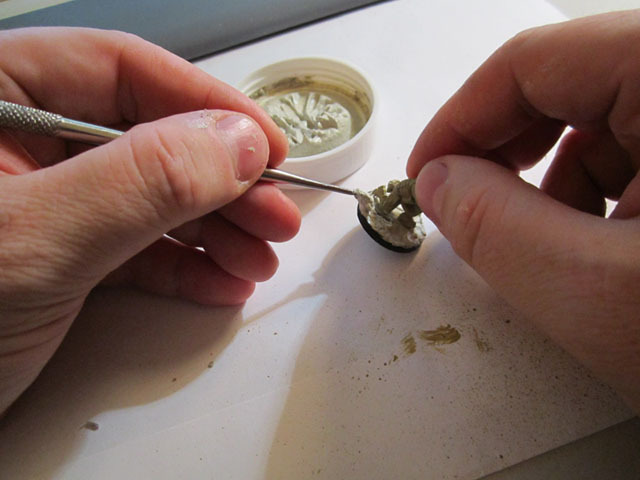 Since with these figures I’ve decided that I want to try a bunch of new materials and techniques, I found the Vallejo Sandy Paste that I purchased awhile back, and decided to ladle it onto their bases. I haven’t used this kind of material for basing before, and have only used non-textured acrylic pastes for adding bulk, such as on my FoW DAK, and then going over the top with regular fine sand. Since the Proxie bases have a slight indent and the Eureka figures have an integral metal base, I used the paste to level out the tops of the bases, using a sculpting tool to apply it, and the same brush as I used for the primer to wipe it off when I got too much on their boots. 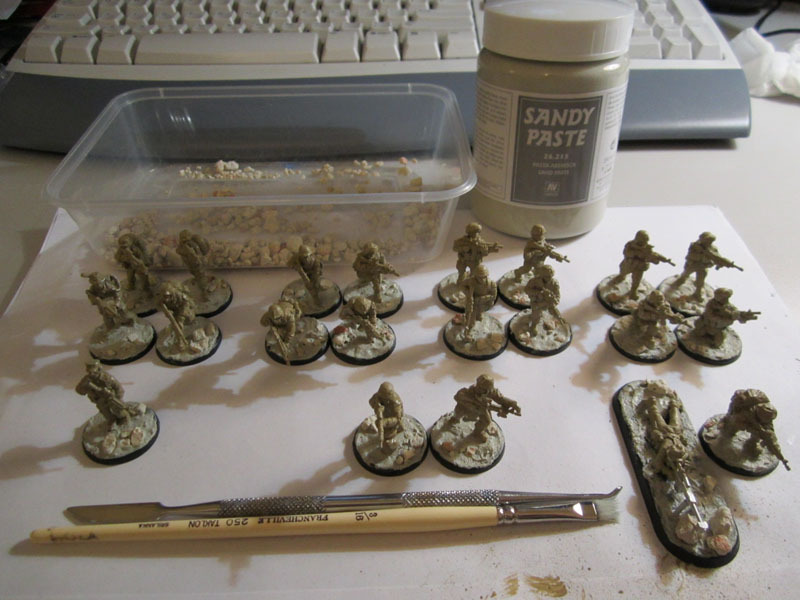 Verdict – the paste is way too fiddly to use on something like a 40k army or a full historical army, but should be fine on a smaller skirmish force like these ones. Finally, I added some kitty litter to the bases to add some texture as rocks. I’m going for a more rural Afghan-style base, rather than simply sand. I added a couple of the larger stones to the front of the sniper, to make it look like he’s found a spot that affords him a little bit of visual cover, while still keeping him in theme with the rest of the figures (so no bricks or ruins). Now I just need to touch up the primer where it got rubbed off during the basing, and the actual painting can begin! 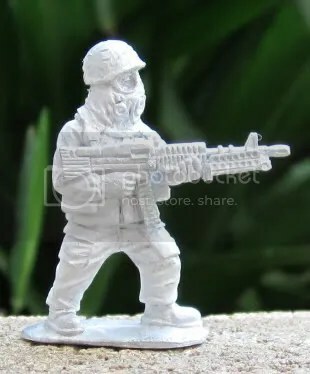 Following on from my post/review of Eureka Miniatures Modern USMC, I’m posting up some photos of the rest of the figures I got in that batch. I picked up two sets of the SEAL Team Six pack, to give me a slightly larger force that I could use in more flexible ways in my miniatures gaming. One thing that I noticed about these figures when I was checking them out on the web is that despite being officially called “SEAL Team Six” (which should be NSWDG, or DEVGRU, or even something else as I’ve heard they’ve had another change of name recently) – these figures would work just fine as Australian SASR, US Army 75th Rangers, and I’m sure quite a few other modern Special Ops and Special Forces units including 1st SFOD-D (aka Delta Force) as well though they are notoriously much more camera-shy than SEALs. With this in mind, I won’t be painting them in AOR1 or AOR2 camouflage (the ones that look like USMC MARPAT – digital camo) but in Multicam, which everyone uses anyway (including DEVGRU). They also come with helmet optics, but they’re so small (and separate parts) that I didn’t bother photographing them. I’d have liked the weapons to be sculpted as HK416s instead of M4 SOPMODs, but that’s probably being too picky at this scale, and besides, the M4s are more universal. Kosta has done a good job on these sculpts once again, right down to the cut of the pants being recognisable as Crye G3, including the integrated kneepads. If he does any more of these sorts of figures, it might be nice to see the AC cut make an appearance as well. 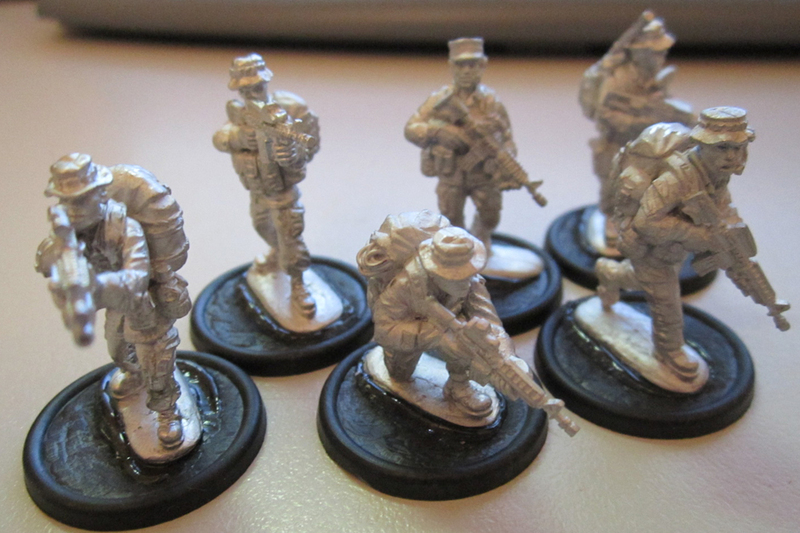 Regardless, they (and checking out the Frenchmen) made me realise that none of the USMC figures have kneepads. With my large order of all of their Modern USMC and SEAL figures, Eureka also sent me along a free sample of a related range: 1960-80s US trooper in MOPP gear. It’s a nice enough figure. The uniform doesn’t have the same amount of detail, but as he’s wearing a MOPP (aka NBC) suit, it’s to be expected. I guess the old-style M1 metal helmet gives the figure a wider range of years the figure could fit into, I can’t help but wish he had a PASGT helpet instead. If he did, I’d buy up a bunch of these guys as they would fit in decently from 1985-2002. Overall, my buying experience with Eureka was very pleasant, with fast service and excellent product. 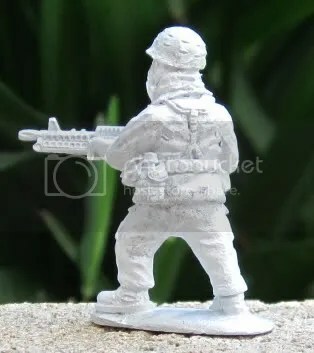 The figures would work as their own group of 40k Imperial Guard for those so inclined, but be warned they’re close to “real” 28mm figures, so they’re a bit smaller and slighter – also known as more realistically proportioned.